With locations in Branson, Mo. and Lancaster, Pa., Sight & Sound is the largest faith-based live theater group in the country. About 800,000 people attend annually to experience “Christian Broadway.” Branson is showing Joseph thru Dec. 29. This original production tells the uplifting message of the forgiveness of Joseph through dream sequences, Egyptian staging, live animals and memorable songs. The Lancaster stage presents Jonah thru Dec. 29. Audiences will witness a whale swimming over their heads, thunderstorms, a mighty 30-foot-tall shipwreck and other stage effects. Groups of 15 or more receive a 5% discount for each adult ticket. Both theaters offer a behind-the-scenes tour thru Oct. 26. Every June in Bath, N.C., Walk in the Light Productions presents The Promised Land. This year the pageant will take place June 29-30. Based on a true story, the original outdoor production follows a North Carolina family that fights in the Revolutionary War and whose descendants move to Missouri to join the new Mormon Church. The story portrays the struggle for peace and freedom seen through the eyes of Joseph Taylor, Sr. and his family and includes a cast and crew of over 150. Pre-show entertainment includes musical performances, colonial and pioneer games, and hands-on activities. Admission and parking are free. Presented by the Church of Jesus Christ of Latter-Day Saints, Hill Cumorah Pageant, now in its 75th year, is taken straight from the Bible and the Book of Mormon. Each July in New York State’s Finger Lakes region, seven performances are presented on the beautiful Cumorah hillside on a gigantic 10-level stage with 12-tower lighting, state-of-the-art sounds and a cast of over 650 people. The production consists of 10 short story scenes on topics including the visions of Christ, a voyage to ancient America, the resurrected Christ and the restoration of Christ’s kingdom. Dates this year are July 13-14 and 17-21. Admission and parking are free. 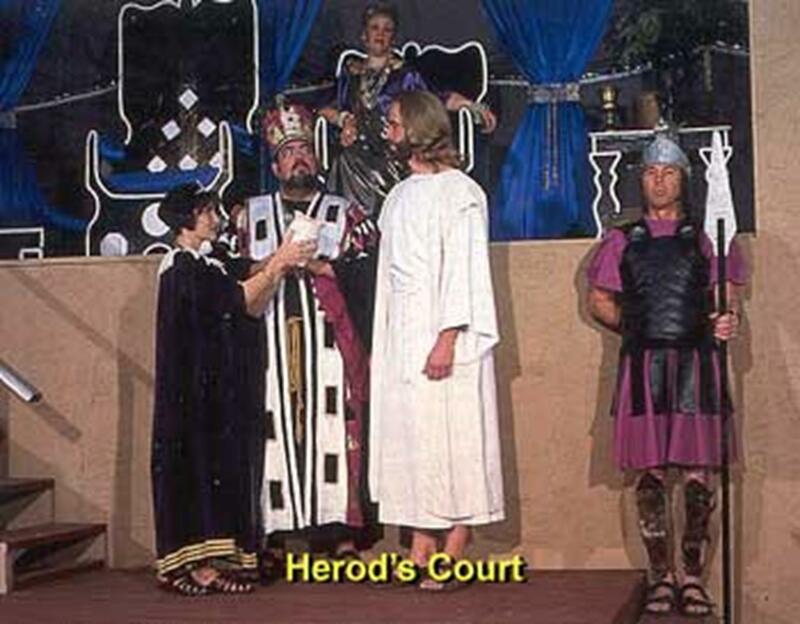 In Eureka Springs, Ark., The Great Passion Play brings to life Jesus’ last days on earth and his death and resurrection amid historically accurate stage settings. The outdoor drama (May to October) has a cast of hundreds, and includes donkeys, camels, sheep and other animals. Before the play begins, visitors can attend the Gospel Music Dinner Theater to enjoy a meal and a variety of music and comedy. Groups also can visit various exhibits, including The Living Bible Tour, Sacred Arts Exhibit and the Berlin Wall exhibit, which features a 10-foot section of the Berlin Wall inscribed with Psalms 23. The American Passion Play in Bloomington, Ill. takes audiences to back to Palestine in 30 A.D. Its 90th season begins March 9, 2013, with five performances through April 6. The play dramatizes Jesus’ ministry, presenting his teachings on faith, love, justice and righteousness. Settings and costumes reflect first-century Galilee, allowing the audience to experience the world as Christ saw it. The play is held in the newly renovated Bloomington Center for the Performing Arts. One of America’s premier Southern gospel festivals is held at Silver Dollar City theme park in Branson, Mo. From Aug. 24-Sept. 3, visitors will see hundreds of performances from big names in the gospel music scene, such as Booth Brothers, Jeff and Sheri Easter, and The Issacs. Shows are held each day in various concert halls and stages, and each night audiences will have to opportunity to attend the Southern Gospel Nights concert series. American Mountain Theater in Elkins, W. Va., known for its family-friendly variety shows, presents its Southern Gospel Concert Series on select Sundays throughout the year. Top gospel groups, like the Booth Brothers and The Isaacs, appear on June 3, July 8 and 20, Aug. 26, Sept. 23 and Oct. 28. The Christmas Spectacular show starts Nov. 23 and runs through Dec. 22. In Fort Atkinson, Wis., The Fireside Theatre, one of the Midwest’s most popular dinner theaters, offers a Christian Concert Series. On June 19-20, Soul’d Out Quartet will perform hymns and progressive gospel and will be joined by comedian Aaron Wilburn. On Aug. 28 the theater will host Christian violinist Bill Murk. Palmetto State Quartet, a Southern gospel recording group, will appear Oct. 2-3. Represented by talented men since the 1940s, the group is a mainstay of gospel music. The leader and bass singer, Larry Strickland, spent many years managing the career of his wife, country star Naomi Judd. Mobile, Alabama is located on the Mobile River near Mobile Bay. Alabama’s only seaport has historical architecture and churches religious group travelers will enjoy.